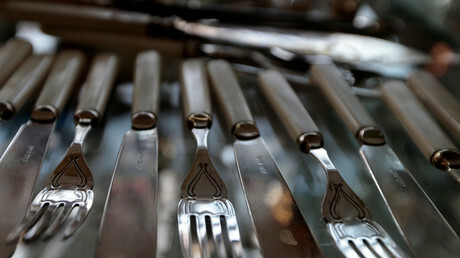 A London private school’s ‘Austerity Day’ lunch has been met with a fierce response online, with many accusing the £24,000-a-year school of being tasteless and out of touch over the meal. While St Paul’s Girls’ School in Hammersmith normally feeds its students the likes of duck leg confit and slow-baked Moroccan lamb, its idea of an austerity lunch is the same kind of food that students in non-fee paying schools across the country eat every day – baked potato, coleslaw, beans, and fruit. The school tweeted about the lunch, served to raise money for charity, using a photograph of a white-gloved waiter serving three peas on a silver platter. Although the school soon deleted the tweet, screenshots of it were widely shared on social media as people expressed disgust at the school’s idea of austerity. My old school's idea of a charity lunch?! @StPaulsGirls_ I highly recommend you rethink this – contrary to popular belief not all your students and alumnae feast on foie gras every meal. Some questioned the menu itself, pointing out that baked potatoes, beans, and fruit are not really on par with what those struggling to survive under austerity would eat, while others questioned the use of the term ‘austerity’ at all given the punishing impact such measures have had on the public since the global financial crisis of 2008. Some of the girls (including the 'posh' pupils) at the catholic school I attended in Wimbledon used to dine on jacket potato, cheese & beans. Not the healthiest of meals, but it wasn't considered an austerity lunch. Others rushed to the school’s defense, commending St Paul’s for raising money for charity, and highlighting its work with food banks. Well-meaning ignorance I think. Why not simply take them to a food bank to work as volunteers? The school told the BBC it has carried out similar lunches for “many years,” in which the money saved on the scaled-down meals is passed on to local charities. St Paul’s students usually have a different lunch menu each week, and can choose from four different self-service stations offering classic British meals, vegetarian meals, fish dishes, and stir fries, an article in the school webzine explains. The dining room also has a salad and fresh fruit bar, and, if that’s not enough choice, the school also has a cafe serving full breakfasts, lunch, and sweet snacks.